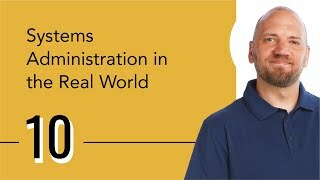 System administration is the field of work in which someone manages one or more systems, be they software, hardware, servers or workstations. Its goal is ensuring the systems are running efficiently and effectively. System administration is typically done by information technology experts for or within an organization. Their job is to ensure that all related computer systems and services keep working (e.g. a website). 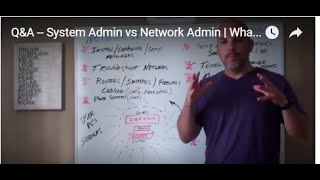 A system administrator, or sysadmin, is a person responsible to maintain and operate a computer system or network for a company or other organization. System administrators are often members of an information technology department. 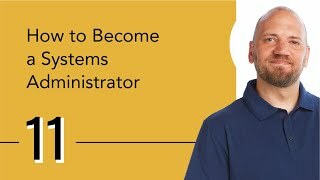 The duties of a system administrator are wide-ranging, and vary from one organization to another. 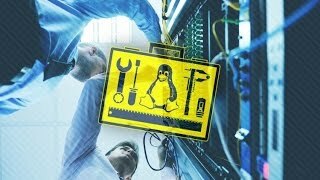 Sysadmins are usually charged with installing, supporting, and maintaining servers or other computer systems, and planning for and responding to service outages and other problems. 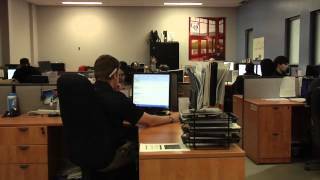 Other duties may include scripting or light programming, project management for systems-related projects, supervising or training computer operators, and being the equivalent of a handyman for computer problems beyond the knowledge of technical support staff. It is common for systems administrators and systems analysts charged with developing and maintaining computer processes to identify operational and developmental systems. This is done to provide maximum reliability and availability on mission-critical systems used within the organization's processes by generic users to accomplish routine work while providing developmental resources to computer process development or research teams augmenting existing or developing new processes for the organization. 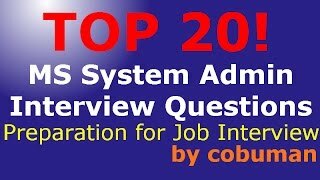 Many organizations staff other jobs related to systems administration. In a larger company, these may all be separate positions within a computer support or Information Services (IS) department. In a smaller group they may be shared by a few sysadmins, or even a single person. A computer operator performs routine maintenance and upkeep, such as changing backup tapes or replacing failed drives in a RAID array. Such tasks usually require physical presence in the room with the computer; and while less skilled than sysadmin tasks require a similar level of trust, since the operator has access to possibly sensitive data. A systems analyst documents, trouble shoots, and develops existing and new computer and work processes and systems. In some organizations, a person may begin as a member of technical support staff or a computer operator, then gain experience on the job to be promoted to a sysadmin position and afterwards an IT Manager. Applying operating system updates, and configuration changes. Installing and configuring new hardware/software. Adding/deleting/creating/modifying user account information, resetting passwords, etc. In larger organizations, some tasks listed above may be divided among different system administrators or members of different organizational groups. For example, a dedicated individual may apply all system upgrades, a Quality Assurance (QA) team may perform testing and validation, and one or more technical writers may be responsible for all technical documentation written for a company. 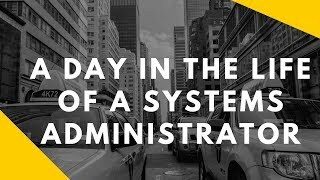 System administrators, in larger organizations, also tend not to be system architects, system engineers, or system designers, however, like many roles in this field, demarcations between systems administration and these other roles are often not well defined in smaller organizations. However, even in larger organizations, senior systems administrators often have skills in these other areas as a result of their working experience. 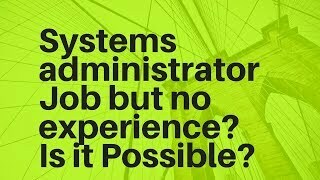 In smaller organizations, IT/computing specialties are less often discerned in detail, and the term "system administrator" is used in a rather generic way -- they are the people who know how the computer systems work and can respond when something fails. The primary goal of being a system administrator is to be as lazy as possible. Not lazy in the sense that you do no work, but lazy in that you get the computer to do the hard and repetitive jobs, and you do the thinking jobs. The next goal of system administration is customer satisfaction. While "having a warm and fuzzy feeling" is a laudable goal, we want to fulfill measurable goals. Measuring things like server availability, time to problem resolution, network availability and error rates will help to measure satisfaction. 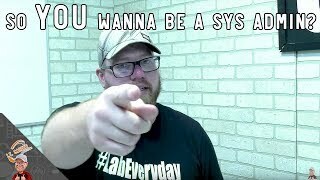 Remember there are at least two customer types in any sys admins job -- other employees, who are consuming the computer/server/network services, and the management (one of whom is the sys admins boss), who are paying the system administrator to steer their computer resources in a reliable and trouble free direction. Balancing and satisfying both customers is important in the long term. Most important, of course, is consistently providing product to end-users. A large part of a sys admins job involve troubleshooting and problem solving. Many problems are user driven, and different users have different levels of competency and understanding of technology. Users are often frustrated over the problem, and sometimes need to vent. But the user is often the best source of information on the cause of an issue. While there isn't a simple guide to every situation, there are a few steps which can help. Isolate the problem as much as possible. Ensure each piece of equipment is working before moving on to the next. Don't make any assumptions. Develop detailed specific information to communicate to specialized troubleshooters brought to assist with specific repairs or system augmentations. People want to know when they are going to see results, so try and think in terms of what your clients are seeing. If the server will arrive in 5 days, but it will take 2 days of setup and 2 days of testing, that is approx. 2 weeks of work, if all goes according to schedule. Don't say "it'll be here in a week", because your client will expect it to be working in 1 week and 1 day then. Don't tell people what you think they want to hear. Be realistic and honest in your estimates, but underpromise and overdeliver. There are always a couple of things that are unforseen, and underpromising allows you real time to work on those items. Overdelivering means either be dead on, or early in completing tasks. If you are early, make sure you explain that you had some good luck (and avoided those couple unforeseen issues) and were able to deliver faster than you expected. There are always a few projects that will take either most of a day or even a few days, but they need concentration and few interruptions to complete in the best way possible. What do you do if your job is to answer end-user questions when they happen, and they usually happen a few times an hour? The best way is to block your time. Most sys admins work in teams, and this is the best way to block your time. Simply ask your team mate to take over all of the interruption type questions you usually deal with for the time you need, and you will do the same for him/her when they need to do a larger project. Many companies have support hotlines and e-mail areas where users can get support for their questions. Often, however, sys admins complain that users ask them questions in person or call them directly to get around these processes. If you have a formal system, first make sure it's integrated. That means that any question, be it e-mail, phone or in person has to be "entered" into the system. No one should get answers without a ticket number, which should be used by both your users and your sys admins to refer to a request. Each request should be triaged, and the requestor should get an estimated time to resolve. The system shouldn't build a moat around the sys-admins, though. The idea is that formal questions go through a formal process, and if this is stuck to, then all users should recieve a consistent answer in a timely manner. It should also dissuade "queue jumpers" from phoning certain people direct to work around the process. These types of processes exist in guidelines such as ITIL. It can be difficult, especially in smaller companies, to convince end users of the benefits of calling a hotline, when they have to wait for the actual sysadmins to respond, instead of calling them directly. In real estate, it's location location location. In system administration, it's important to create a documentation trail so you know what was done, when, and by whom. This can be something as simple as short log entries (date-time/username/action), or formal guides. It is especially critical when you are debugging or doing emergency troubleshooting to keep these entries, as changes can affect security, stability or availability of resources. The best system is one that collects configuration changes made into a central location. Often a version tracking tool, such as CVS or SVN can be used to accomplish this, with the added benefit that you get automatic backups of any such configuration. Regression testing or planning. New systems should meet all old requirements which remain current while adding new capabilities. 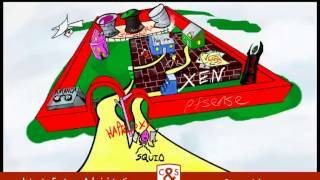 Systems analysis or designing system augmentation or modifications. Both the client and server software that a system administrator uses is very important for every system administrator. Proper software can save a system administrator lots of time and money. It can also be a huge benefit if the source code is available for the software, in the event that a bug is found and the provider is too expensive/slow to fix it and/or come up with workarounds. up.time - server monitoring and capacity planning software. Free 14-day Enterprise trial available. Nagios - One of the best open source monitoring applications in existance. Start with the base, then get some fantastic plugins. InfraRecorder Open source dvd / cd burning application similar in functionality to nero. ImgBurn Freeware cd / dvd burner which allows the user to burn cd /dvd image files to a disc. MySQL - A popular database program. GRAPHsql - Allows user to generate code for MySQL using a graphical interface. Scalable Cluster Environment - A set of tools to assist users in building clusters of servers. The BIOS has different POST codes, which can give indications to problems with a computer. Wikipedia has an article on the POST, including some of the codes it can give. Different models of computers have different key combinations for entering the BIOS. They can be very handy to use if you need to guide a non-technical user over the phone. The majority of computers use F2 or Del to enter the BIOS on boot-up but other keys are sometimes used, including alphanumeric keys. Other options on boot-up include F12 to show the boot order and F8 (on Windows) to open the boot menu. Safe-mode can be booted from this menu. Award Modular BIOS' use Del to enter setup. IBM BIOS' ("300" series PCs) use F1 to enter setup. If you get a restricted menu, you'll have to switch off and on. Some servers come installed with two SCSI BIOS. IBM eSeries (P3s) Ctrl-A for Adaptec, Ctrl-I for IBM. Some HP computers use F1 to both enter boot order and BIOS setup. A few may require power Off and On, otherwise you'll get a minimal BIOS menu. On some IBM computers, press the blue ThinkVantage button to get a menu where you can select the BIOS, which device to boot from, etc. You can also press F12 for the boot menu. See this guide from "the SBS team". Question: Do I Have to Do Desktop Support Before I Can Be Hired to Be a Systems Administrator? 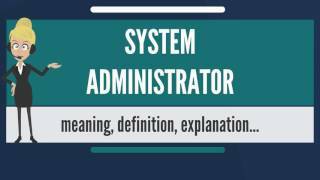 What is SYSTEM ADMINISTRATOR? 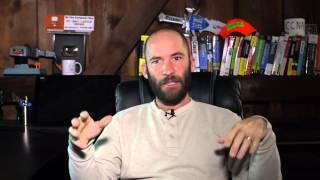 What does SYSTEM ADMINISTRATOR mean? Can I Just become a System Administrator? Question: What books would you recommend for a System Admin? 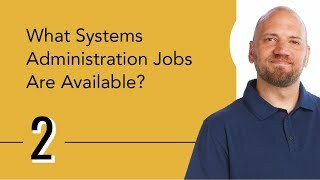 What Systems Administration Jobs Are Available?